It was Sunday morning. We had been to mass and headed into the main Piazza when we saw some kind of foot race underway. Lots of people were wearing numbered bibs and carrying maps. What? Why were they carrying maps? Shouldn’t the route be marked through the city? Then we noticed that runners were going in all directions at once, no one following anyone else. 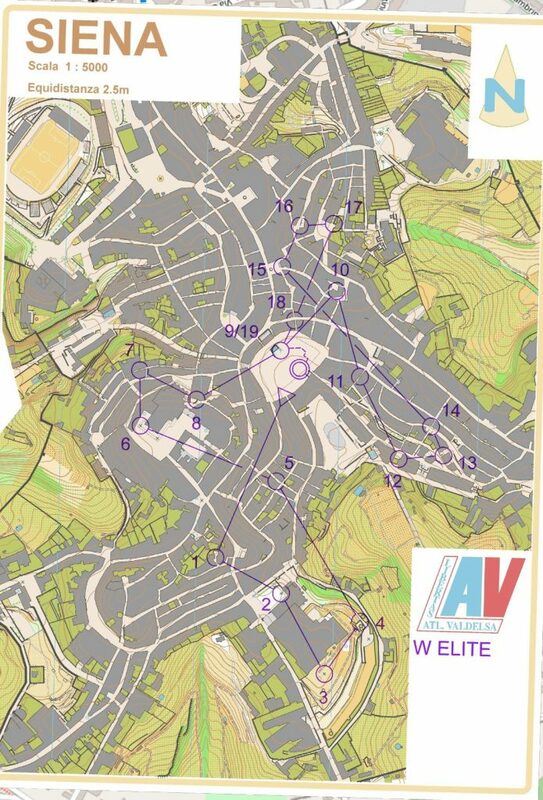 Welcome to the world of orienteering races. You are given a map showing you where you need to go, but not the route to take, leaving that to each runner. 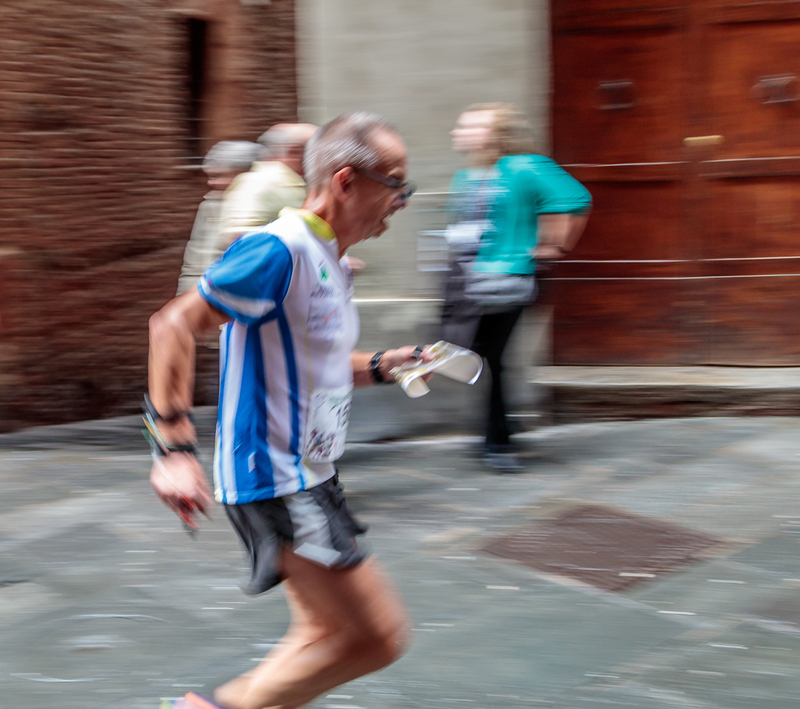 In a city like Siena, there are lots of possibilities in choosing a route that is short and without many hills. Not all routes are created equal. The streets are not laid out in a grid as we are used to in the US, but many streets are short, going only a short block. Others wind through the town. There are no direct routes from one point to another as you can see from the map below. So, starting in the Piazza, you try to find stop #1. You have an electronic chip that can be read at each of the 19 intermediate stops. They must be accomplished in the proper order. Some runners had compasses. Others just the map. 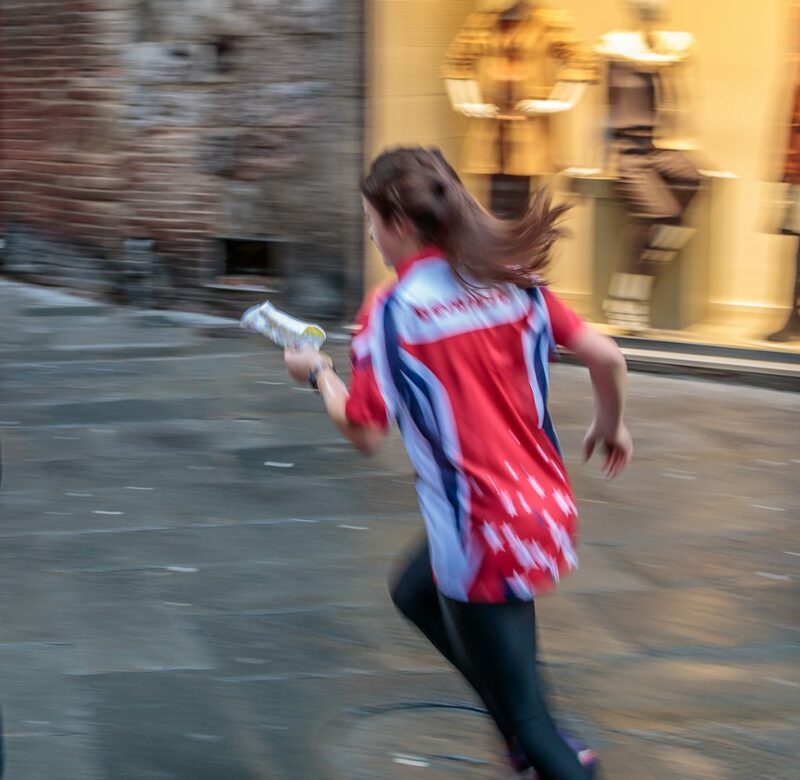 We saw runners all over town in search for the next check-in station. Sometimes the runners had to stop and check where they were against their map. 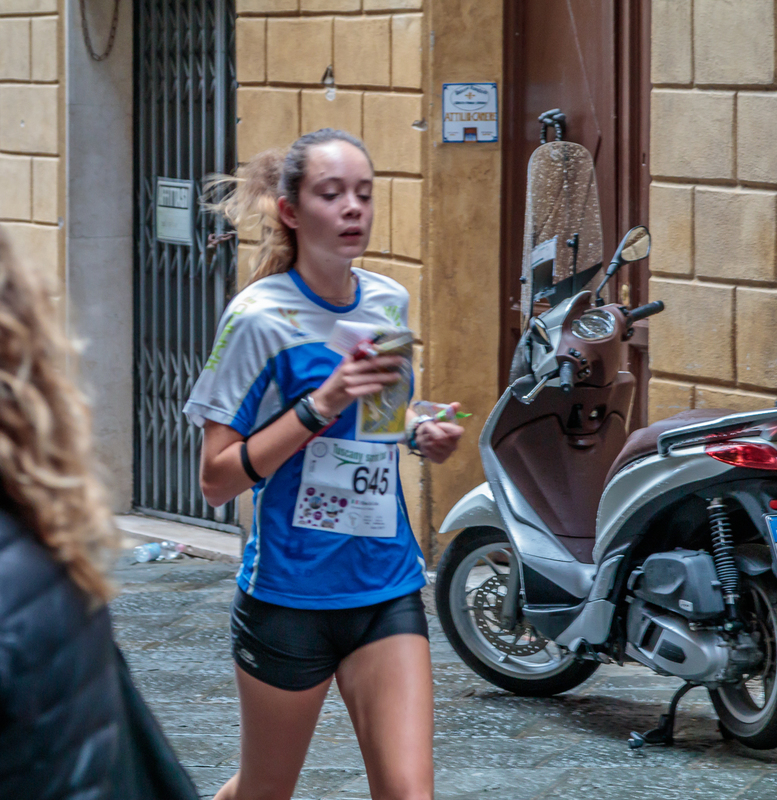 It was an interesting thing to see in Siena, and Siena is a great town for this type of race due to the way the streets are laid out. With the staggered start (over about 1.5 hours), we saw runners all over town, and they just kept coming, and going. 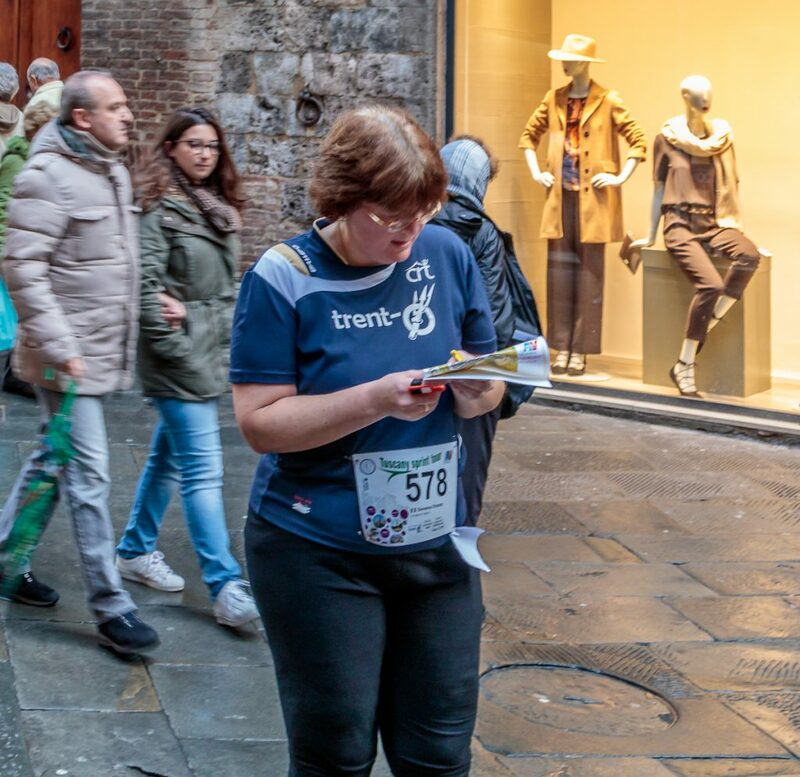 This entry was posted in Travel and tagged Italy, Orienteering, Race, Siena.